Lisa Eldridge www.lisaeldridge.com. I adore her makeup tutorials. I bought mine from www.gurumakeupemporium.com for £22.50 each plus £2.95 postage. The postage is quite fast with this company which is a bonus! It is expensive, however you only need a teeny tiny pump of product as it goes along way. Not even a pea sized amount! 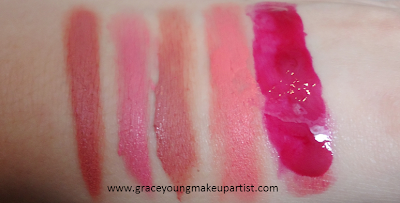 These blushes are very pigmented, have amazing staying power and are fantastic quality. 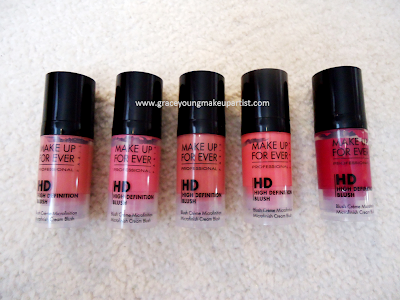 They come in a variety of shades, which is great for all different skin tones. They photograph beautifully. Once applied and blended, they dry matte. I love using a MAC 130 brush to apply this as it buffs into the skin really nicely and gives an airbrush finish. I'm not sure what happened to my HD blush on the far right; I think I should have shook the bottle thoroughly before putting it onto my hand but this has never happened before - so don't let it put you off of purchasing these amazing blushes. I really want to try the HD foundations, powders and primer, as I think these will look amazing on the skin; especially for photoshoots or brides. I always have them in my kit now! Hope this was useful guys!